WHAT IS TORQUE & TENSION? 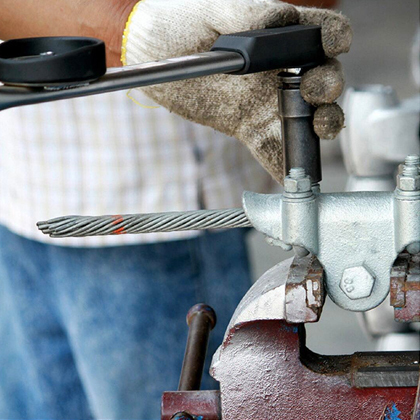 Torque is the amount of force it takes to install and tension is the stretching of a bolt that provides the clamping force (clamp load). When installing or assembling mating parts, it is pivotal to assemble the parts to the correct clamp load (or tension). The target clamp load (tension) for bolts is 75% of proof strength/load. The amount of torque necessary for fastener(s) to reach the target clamp load is dependent on the lubricating qualities of the finish on the fasteners. Over tightening can cause excessive stretching of the fastener joint, causing the fastener to become loose over time or break during assembly. Under tightening can cause the fastener to vibrate loose over time. The need for post lubricants has been eliminated due to the integrated lubrication built into RIE’s top coats. These integrated friction modifiers ensure consistent assembly allowing the proper clamp load to be achieved. How lubricious a coating is determined by total coefficient of friction, a dimensionless value. The lower this value is, the more lubricious the coating. Depending on the lubricating pigment and the concentration of the lubricant in each coating, RIE has coating options in a coefficient of friction range of 0.07 to 0.35. The correct amount of load ensures the fastened joint remains properly assembled. The standard deviation in input torque and/or clamp force is extremely low in comparison to zinc electroplating. Inconsistent assembly can lead to under or over tightening. The use of coatings with integrated lubrication reduces the amount of torque required for installation, allowing for easier assembly and can also prevent thread galling or seizing during installation. RIE customizes coatings for applications that have a specific coefficient of friction. Our test lab provides us the ability to measure torque, tension, k-factor and total coefficient of friction to ensure the coating process meets end user requirements. RIE’S mission is to be the clear supplier of choice by providing superior customer service, responsiveness, quality, innovation and products. We apply coatings for protection and performance to a variety of surfaces and substrates including carbon steel, stainless steel, zinc plating, aluminum, composites, plastics, rubber, copper, brass, and other ferrous and non-ferrous metals. Our technical staff are committed to helping educate our customers on what coatings can offer. If you are new to coatings, we’re here to help. Tell us about your needs. Every project has unique challenges. We can help find the best solution to fit your needs.